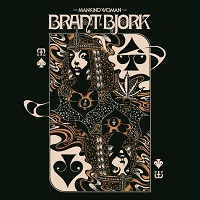 From their Facebook Page, One severely doubts it’s a coincidence that a Brant Bjork set would start with “Buddha Time (Everything Fine).” That laid back, instrumental, rolling desert groove speaks to an aspect of Europe ’16 that’s apparent before the needle even hits the wax of the Napalm Records release, and that’s the manner in which Bjork — whose career pedigree in as drummer/songwriter in KYUSS, drummer in FU MANCHU, guitarist/vocalist in CHE’ and multi-instrumentalist, bandleader and songwriter in the various incarnations of his solo work from Brant Bjork to BRANT BJORK AND THE OPERATORS, BRANT BJORK AND THE BROS. and BRANT BJORK AND THE LOW DESERT BAND has made him the undisputed godfather of Desert Rock — directly acknowledges the Stoner side of who he is and what he does. His newest album here, “Mankind Woman,” contains eleven tracks. “Chocolatize” opens the album with a slow and swinging riff, fueled by fuzzy bass guitars and easy-listening vocals. The main riff dips low and reaches for your balls. “Lazy Wizards” features a nice and steady guitar riff that isn’t overly trippy, and vocals that are sung with emotions. Light and airy, the track is just so smooth, like butter to your ears. “Pisces” swings with a positive and upbeat sound, from a solidary guitar and steady drumming. This seems to be the formula thus far on the album, accessible tracks that’s aren’t overly psychedelic. “Charlie Ginn” has a 4/4 rhythm that is augmented with a bar of the same meter, but where the drums are hitting on the “off beats.” It creates a bit of magic, lifting the song off the page. The title track, “Mankind Woman,” is a four-and-a-half minute beast of soulful and lumbering guitar riffs, with a little wah-wah thrown in. The bass guitar thwacks away in the background without a care. “Swagger & Sway” leads off with a riff that starts to get you in the mood. It moves forward intentionally and in a straightforward method, picking up little trippy elements along the way. “Somebody” opens with a little psychedelic groove that gets your foot tapping, along with some vocal quips in the background. When the main vocal line hits, it is soft and smooth. The main riff builds and builds into a mesmerizing passage to completion. “Pretty Hairy” is a funny song title, for a funky song with a faster pace. Bass guitar leads this procession, while the six-string remains in the background. “Brand New Old Times” is a quick two minutes in length. It has a positive tone and an easy listening tone, but fades out almost as quickly as it started. “1968” harkens back to a time before the change of a decade…Vietnam, hippies, war protests, and bell-bottoms were right around the corner. The simple sound begins to multiply with additional guitars and cymbals. “Nation of Indica” closes the album. It of course refers to the nation of smoking marijuana, and talking about man wanting to start wars, taking more than he needs, and not understanding people. There is a plethora of different messages in this song….feminism, love and kindness. Overall, the album was easy on the ears. Save for the last song, it didn’t have a lot going on and was very minimal, something that is true to the genre. The songs were fun and Brant’s voice was polished and mellow. I am sure his fans will find this to their liking.